When street artist Banksy destroyed one of his works of art last week seconds after it was sold at auction, he probably added to its value, with some experts suggesting it could now be worth double its original price. No one knows how the secretive artist activated a shredder hidden within the frame of his painting "Girl with Balloon" just after it was sold last week by Sotheby's for £1,042,000 ($1.4 million, 1.2 million euros). The maverick British artist posted a video on Instagram in the wake of the prank accompanied by a quote attributed to Pablo Picasso -- "the urge to destroy is also a creative urge". He said he had fitted the shredder in case the painting should ever be put up for auction -- where its final price set a joint record for his work. "Banksy might think that by destroying his art he's undermining capitalists who buy it, but he's wrong," commented Mikael Faujour of the specialist French art magazine Artension. "The leftovers from this destruction will acquire a new prestige and additional monetary worth," he said. Thierry Ehrmann, who heads Artprice, a firm which closely monitors art market prices, agreed that the prank had probably increased the value of the work. It might now be worth "more than two million euros," he suggested. "It's a performance in the line of Marcel Duchamp's 'Ready Made'," he said speaking of a term coined by the French artist in 1915 to describe a sometimes modified, but always common object, not usually thought of as a work of art. "Banksy reminds people that, even in a prominent auction, all his art is fleeting," he added. Arnaud Oliveux, an expert at the Artcurial auction house Paris, suggested Banksy was careful not to destroy the whole of his painting. Because it is only partially shredded, "it becomes something else, egged on by the social media buzz" and acquires the aura of "an iconic work of art", he said. Artcurial will shortly auction three Banksy paintings, along with a resin-crafted figure of a rat holding a paintbrush signed by the artist. Sotheby's claimed to have been surprised by Friday's auction prank, but some art experts have questioned how it was possible to pull it off without their knowledge. Works of art and picture frames are usually studied with care and attention prior to sales, they say. 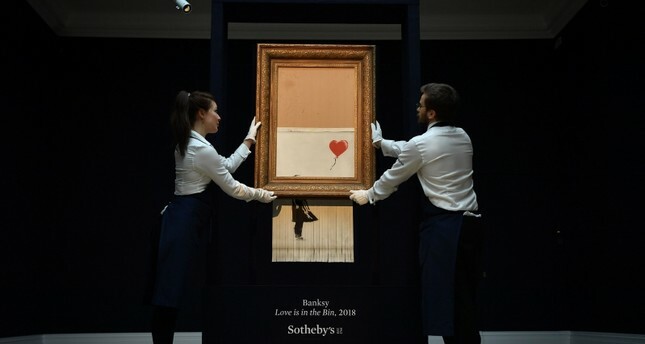 The auction house revealed Thursday that the modified Banksy has since been renamed as "Love is in the Bin", and certified by Pest Control, the artist's authentication body. Sotheby's said the unnamed buyer, described as a female European collector and long-standing client of the house, has gone ahead with the purchase for the price agreed on the night. "When the hammer came down last week and the work was shredded, I was at first shocked, but gradually I began to realise that I would end up with my own piece of art history," the buyer was quoted as saying.